Our Lady of Loreto Chapel. On our recent trip to the Gulf Coast of Texas we stopped in Goliad. We thought we’d only stop for one night and see the sites the next day, then move on down the road. Well unfortunately, the first evening there, I got food poisoning – so all that next day - all I saw was the inside of the hotel room. The good news is that I felt better the following day and we were able to visit Presidio Nuestra Senora de Loreto de la Bahia, a National Historic Landmark in Goliad, Texas. The Presidio was established at this location in 1749. One significant fact is that the Presidio and the two missions constitute the only surviving example of Spanish Colonial mission/presidio complex in Texas and one of a very few in North America. 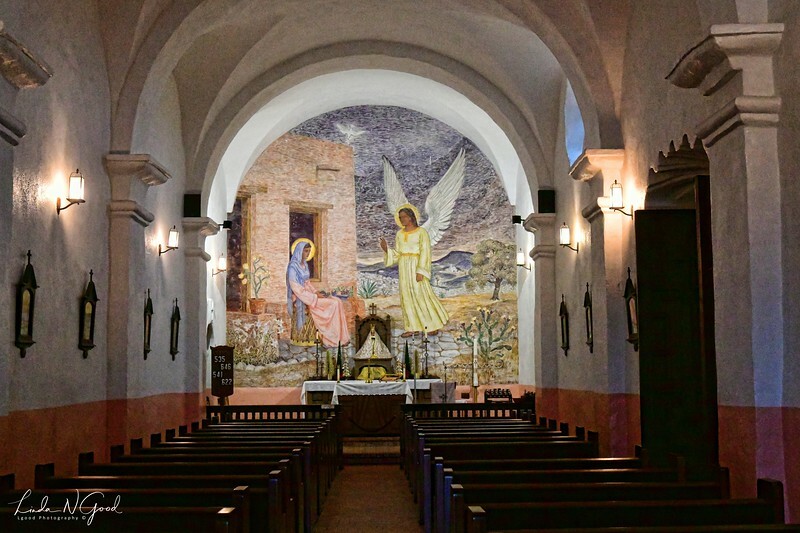 This is a photo of the interior of the chapel at the Presidio La Bahia and it is the Our Lady of Loreto Chapel. It is still an active community church. The chapel is the oldest building in the compound and has been in continuous use since the 1700s. It is one of the oldest churches in America, it also is one of the only buildings in existence that has it’s original “groin vaulted ceiling” in place. The fresco featured here was done in 1946 by renowned Corpus Christi artist, Antonio Garcia also known as the Michelangelo of South Texas. Located above the chapel entrance is the statue of Our Lady of Loreto sculpted by Lincoln Borglum, of Mt. Rushmore fame. You will see that sculpture in future photos. The chapel was where Fannin’s men were held during part of their captivity before being massacred. The First Declaration of Texas Independence was signed inside this chapel. Find a place to spend some time today that soothes your soul. Superb composition and exposure !! Very lovely chapel. The mural really shows the desert/southwest influence in the artwork. I would love to sit there and just look and look. Beautiful capture & chapel Linda, love the artwork behind the altar, the angels wings are awesome! Lovely shot of the mural and excellent information Linda! :) on the blueberry muffins. You get a reprove for a few days. I get to go fix a Sentra door lock system. Driver will not lock and passenger will not unlock and it is 30 degrees! You think this could have happened when it was 70!!! :). HAGD & weekend. PS drivers I can fix, just a switch that I have passenger I think the actuator is bad and need a part at a min :(.